"No, Kevin. The Ides of March are a time of the month." - I bet you think this blog is about you. "No, Kevin. The Ides of March are a time of the month." Gold star to anyone able to name the TV show that generated that quote. Yes, I'm on a computer all day, and my Outlook calendar runs much of my work life. But it's much easier when scheduling to have a quick glance at this than to go to Outlook where I have to change from "day" view to "week" or "month" view to achieve the same result. And using the PC's built-in calendar is just much less fun. 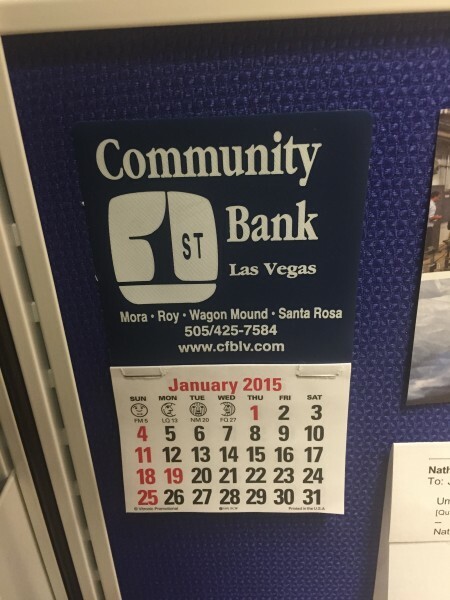 This bank, which was known as First National Bank of Las Vegas for my entire childhood, has been handing out these tiny adhesive calendars for decades and they still look identical except for the logo. When I was really young I remember that my parents had accounts both here and at the Bank of Las Vegas*, around the corner and one block down. I liked going to BoLV as a young kid because they had a dramatic building with faux-Doric columns and a two-story atrium, plus the bank vault door was visible and super nifty. Whereas FNBoLV's main branch was a nondescript one-story office that had nothing aesthetically exciting to offer the budding architecture nerd (yes, I started early on that). Anyhow, I always liked the basic little calendars with the full moons that look like Charlie Brown. My parents don't have accounts at BoLV anymore, but are in Year 45 (at least) of being FNBoLV customers. So while that's the case, they continue to collect them every January, stick one on the car dashboard and one on the fridge, and happily mail extras to me. Speaking of calendars it seems a little late in winter, but we did finally get some snow tonight. It only kept up for a couple of hours and hasn't been a major issue in the city. But the wind has been completely nutty since the sun went down, and it appears from peering out the window that the two combined have kept tons of people indoors. The streets are super empty, even for a holiday weekend. I too decided to stay in tonight rather than attempt to get to Mixtape; I only left the house for the gym in the early afternoon and then to drive B to work at 9 tonight. It's probably best I stayed here because our chairs on the patio were being knocked around like crazy by the wind and could have flown over the edge. I pulled them inside, and while out there in just a T-shirt remembered B also usually keeps an ashtray out there. Given the up-to-50-mph gusts, I was half convinced it had already been blown on to the street four floors below. But it was still there, frozen solid upside down to the concrete floor. I spent five futile seconds trying to pry it free, but seeing how I was about to get insta-hypothermia and it wasn't budging, I gave up and left it in place. It likely won't move until March. * They've changed their name too, but I understand both are still lovely and community-minded as small town banks tend to be. Yes, while driving my boyfriend to work it very much looked like I was living in Michigan again. Brr.